Bighorn Outfitters offers a float hunt on the Middle Fork of the Salmon River for Elk, Mule Deer and Bear. Bears are hunted in the Spring of the year. Elk and Deer in the fall. 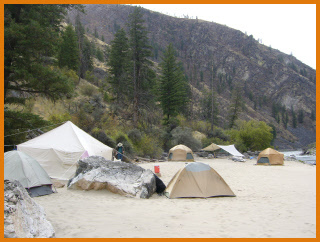 The river outfitter provides all the gear to float and camp on the river. Bighorn Outfitters provides all the gear for the hunt on the mountain. This hunt can be 1X1 or 2X1 with price breaks for larger groups. This hunt is a physical hunt that requires hunters to be in top shape to ensure success. The season runs April 1-June 30th for Bear and September 15 thru November 18th for Elk and Deer. Note: If you plan to hunt Mule Deer after October 24th you must apply for an unlimited controlled Deer tag in the month of May. 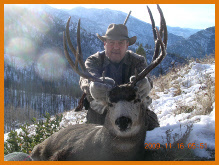 We now offer December archery mule deer hunts. Often times mule deer rut into early December offering a great opportunity for a Trophy Buck. Tags are guaranteed and camps hold up to 4 hunters. This hunt is a wilderness horseback hunt with little or no pressure from other hunters. This hunt can be combined with elk, cougar and wolf at the same time for an additional fee. Does not include 6% sale tax and gratuities. 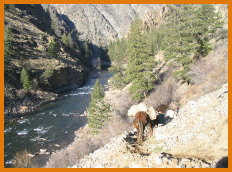 Bighorn offers a unique Spring Float hunt on 30 miles of the Middle Fork of the Salmon River. Black Bear and Wolves are available on this one of a kind hunt. You will float and camp on the river and hike up out of the river to spot and stalk for both bear and wolves. While hunting thru the wintering grounds there is the possibility of picking up elk and deer sheds with also the chance of finding bighorn sheep skulls that have winter killed. This hunt does not include fly in cost to a remote airstrip. This November rut Mule Deer hunt is a very remote and exciting experience. You will fly into a back country airstrip then ride 18 miles to camp. 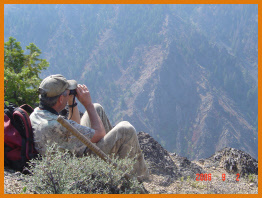 You will spend 6 days hunting during peak Mule deer rut. This hunt can be combined with elk for an addition fee. A minimum of 4 hunters are required to do this hunt. Flying costs are the responsibility of the hunters. We only do this hunt every 2 or 3 years. * All float based trips are partnered with a licensed river outfitter.